Dropbox and various online third party cloud services are great and free to certain expectations, but to truly have all you can eat buffet kind of expectation is definitely not the kind of thing that these cloud services can provide. Right off the bat, one thing for sure that these third party cloud services cannot provide is the best privacy level that one could get with having storing data within one’s own private network. Want to have more cloud space than the so called free space? It’s not free, and you have to pay more for how many more Gigabytes you want and so forth. ownCloud is a free, open source software which acts like DropBox, but you can download, install, and use it freely. I think ownCloud does give you the opportunity to be 100% in control of your data’s privacy. If you know how to implement robust security measures such as proper firewall and port-forwarding, you can even allow yourself to roam the seven seas and still be able to sync with your local data securely. Unlike DropBox and other third party cloud services, you know you’re the master of your own data in the cloud when it comes to ownCloud those data. OK, I begin to rant on unnecessarily. Anyhow, want to know how to install ownCloud and use it? Check out the video right after the break, I show you how to install ownCloud on Linux Mint. Of course, you can follow the video’s instruction to do the same for Ubuntu, because Linux Mint is just an Ubuntu based distribution. Enjoy!!! I was installing Linux Mint 17 for a virtual machine on my PC, and I decided it was a good idea to record the whole process. Furthermore, I also installed Adobe Reader manually on Linux Mint 17, and so by watching this video you will also know how to do this. If you’re trying to do what I’ve done within this video, make sure you do not deny shell access and lock the password for the regular user or users that you want to use, because if doing so you will not be able to log into the system. Of course, if you follow my video closely, deny shell access means editing the /etc/passwd file, and lock password means editing the /etc/shadow file by executing the command line passwd -l [username]. Moreover, if you’re trying to edit the /etc/fstab file as I’d done in the video, make sure you make a copy of the original /etc/fstab file first before editing the original /etc/fstab file. /etc/fstab file is very important, because it tells the system how to load up the devices such as hard drive, and screwing this file up will prevent your system from loading/booting. Having the original copy of /etc/fstab file will allow you to restore it in the case that you screw up the original /etc/fstab file. If you are going to pay close attention to my part of editing /etc/fstab file, you will notice that I’d made error on adding rw option to the /tmp and /dev/shm devices, but you will also notice that I had correct the errors in the video few seconds later. Basically, rw option is correct, but in the video, before I made the option as rw I had the option as wr. By having the option as wr, the system won’t recognize this option. So instead of wr, it should be rw. rw is a permission option. By adding rw option to /tmp and /dev/shm, the /tmp and /dev/shm devices won’t allow anything to execute commands in these devices, but these devices only allow whatever to read and write to them. Anyhow, you can check out this video right after the break. Enjoy!!! I’ve known of Blender, open-source/free 3D rendering software, for a long time and installed the latest version onto my PC whenever the opportune moment arrived, but I have never really tried to learn and use it. Today, I committed some of my time to try to create my first Blender’s 3D rendered image. By following the “Blender Tutorial For Beginners: Coffee Cup” videos (there are 2 parts), I was able to render a very nice coffee cup. I did not follow the tutorial videos I mentioned to the letter, because I scaled the middle part of my coffee cup a bit bigger and outward. Basically, what I meant was that my coffee cup is more round in the overall shape. Moreover, I rendered the coffee cup with 1000 samplers and .98 clamp. The tutorial videos rendered the coffee cup with 250 samplers and .98 clamp. According to the tutorial videos, the higher the number for the samplers of a rendered image, the better the image will look. I guess, it’s also true for the clamp. I think the higher the clamp number between 0 and 1, the less fireflies there will be. The tutorial videos explained that the fireflies are those white pixels that appear in unwanted place when the image gets rendered. I guess .98 clamp meant 98% for clamp, but please do correct me if I’m wrong on this. 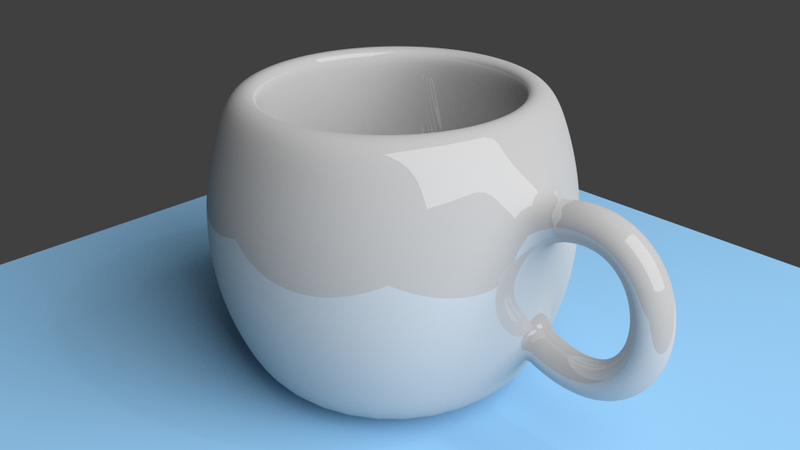 Anyhow, after following the tutorial videos, I got myself a very nice 3D rendered coffee cup image. Check out the cup right after the break. You can download the Blender project files that I created for this very image by clicking on this link -> Blender 3D rendered Coffee Cup Project Files By Vinh Nguyen. I used Blender 2.7 version to render this very 3D coffee cup image. Right after the break, you can check out the YouTube tutorial videos that I watched and learned to create the coffee cup. In the video right after the break, I briefly talk about how to permanently mount a network share onto Ubuntu and Linux Mint. Enjoy!! !